Military cemeteries, designated to honor men and women who served in national defense, are becoming overcrowded, forcing them to close. Vietnam, Laos, and Cambodia. At the Tomb of the Unknown Soldier at Arlington Cemetery stand guards twenty-four hours a day, 365 days a year. Across America and the world stretch the graves of approximately 1.1 million Americans killed in the line of military service. 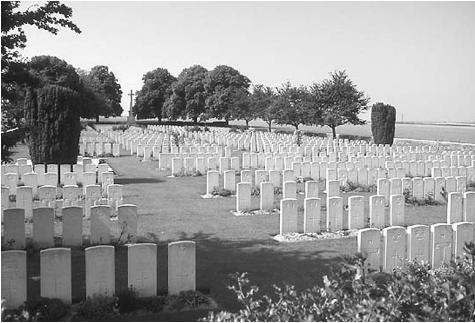 The federal government maintains 119 national cemeteries in the United States and twenty-four others in a dozen foreign countries, containing approximately 2.5 million gravesites. In addition, also restricted to those who served in the armed forces and their immediate families are sixty-seven state veterans' cemeteries. These homes for the dead are preserved by the nation for those who sacrificed their lives in its defense. To understand such actions and expenditures one needs to consider the workings of civil religion, or the ways in which politics command the sacred and thereby divinely endow its causes. Evidence of civil religion is on U.S. currency ("In God We Trust") and within the Pledge of Allegiance (the phrase "under God" was added in 1954 in the midst of the cold war). Memorial Day is the state holy day, and national cemeteries and memorials its sacred sites. Political systems, like religion, confer immortality to their elect. And what more deserving recipients than those who sacrificed their lives for the state? In a highly individualistic culture such as the United States, the preservation of these individuals' unique identities is paramount in the immortality business, which explains in part the considerable lengths the military goes to recover and identify its fallen—and the ritual care given to those whose identities are unknown. The Department of Veterans Affairs furnishes at no charge a headstone or marker for the unmarked grave of any deceased U.S. Armed Forces veteran not dishonorably discharged. When in 1980 the Veterans Administration began removing 627 bodies of unknown Civil War soldiers in the Grafton National Cemetery in West Virginia from their individual grave sites to be placed in a mass grave (with an imposing headstone bearing the inscription "Now We Are One") there was collective outrage from veterans and amateur historians. Despite the fact that space was badly needed, the right to individuated memorials was preserved. To preserve the sanctity of these burial sites, the Veterans Administration runs a limited number of cemeteries, with one exception: the most sacred of sacred sites, Arlington National Cemetery. Administered by the Department of the Army, here across the Potomac from the national capitol lie the remains of more than 250,000 Americans. To preserve its purity occasional pollution rituals occur, as in late 1977 when the body of M. Larry Lawrence, the late ambassador to Switzerland and a fabricated World War II hero, was unceremoniously exhumed and removed. With over 1,000 World War II veterans dying each day, and because the United States has been engaged in so many wars and "police actions," the problem faced by the National Cemetery Administration is lack of space. As of the beginning of 2001, thirty-one of the 119 national cemeteries are closed to new burials; only sixty of Arlington's 612 acres can hold new graves. Douglas, Mary. Purity and Danger: An Analysis of Concepts of Pollution and Taboo. New York: Frederick A. Praeger, 1966. Kearl, Michael, and Anoel Rinaldi. "The Political Uses of the Dead as Symbols in Contemporary Civil Religions." Social Forces 61 (1983):693–708. National Cemetery Administration. "Statistics and Facts." In the Department of Veterans Affairs [web site]. Available from www.cem.va.gov/facts.htm .